Citrullus lanatus var. caffer (Schrad.) Mansf. Citrullus lanatus var. citroides (L. H. Bailey) Mansf. Citrullus vulgaris var. caffrorum Alef. The citron melon (Citrullus caffer) is a relative of the watermelon, also called Citrullus lanatus var. citroides and Citrullus amarus, fodder melon, preserving melon, red-seeded citron, jam melon, stock melon, Kalahari melon or tsamma melon. It is in the family Cucurbitaceae which consists of various squashes, melons, and gourds. Its fruit has a hard white flesh, rendering it less likely to be eaten raw; more often it is pickled or used to make fruit preserves, and is used for cattle feed. It is especially useful for fruit preserves, because it has a high pectin content. The citron melon is native to Africa, probably the Kalahari desert, where it still grows abundantly. The time and place of its first domestication is unknown, but it appears to have been grown in ancient Egypt at least four thousand years ago. It is grown as food in Africa, especially dry or desert regions, including South Africa. In some areas, it is even used as a source of water during dry seasons. Today, it is not only found in Africa, but also domesticated elsewhere. It is known in the southern plains states[clarification needed] as pie melon, as well as citron melon. It has become a feral species, growing wild, in western Mexico. 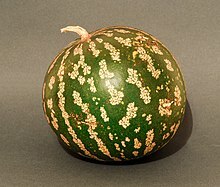 The actual fruit of this plant resembles the more modern, domesticated watermelons, except that it is smaller and more spheroid. The meat of the melon is more whitish and dense, though, and much stronger in flavor, akin more to the area on a domesticated watermelon where the red meat is just turning into the white rind. As noted above, while some people do eat it raw, it's more often cooked or prepared in some other way. Citron melon leaves are palmate in the early stages of growth, and deeply lobed in later development. They have a rough texture and a visible white venation. Solitary flowers with large, yellow petals of around 2-10 millimeters are randomly dispersed forming many seeded fruit with a variegated light green and dark green pattern. The citron melon should not be confused with actual citron, a citrus fruit originally used, since ancient Egypt, to repel insects, but which in modern times is also sold candied, or cooked into fruitcake. ^ a b c d e "Citrullus amarus". Germplasm Resources Information Network (GRIN). Agricultural Research Service (ARS), United States Department of Agriculture (USDA). Retrieved 29 March 2015. ^ Vermaak, I (2011). "African seed oils of commercial importance - Cosmetic applications". South African Journal of Botany. 77 (4): 920–933. doi:10.1016/j.sajb.2011.07.003. ^ Laghetti, G.; Hammer, K. (2007). "The Corsican citron melon (Citrullus lanatus (Thunb.) Matsum. et Nakai subsp. lanatus var. citroides (Bailey) Mansf. ex Greb.) a traditional and neglected crop". Genetic Resources and Crop Evolution. 54 (4): 913–916. doi:10.1007/s10722-007-9220-y. This page was last edited on 18 February 2019, at 01:43 (UTC).